Today continues the story of Paris and Art Deco with the work of fascinating artist Bernard Boutet de Monvel, whose art is the subject of a Sotheby’s Auction in Paris on April 5th and 6th. 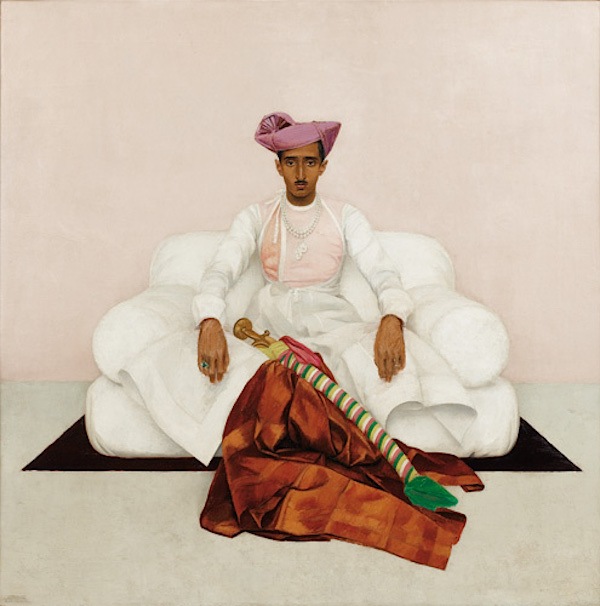 I first became acquainted with the work of Boutet de Monvel from the portrait of Le Maharadjah d’Indore which graces the cover of a favorite book, Made for Maharajas. It is a marvelous depiction of Raj life and the Indian royals’ love of Western luxury. Dangling from the Maharajah’s Chaumet pearl necklace are the “Indore Pears,” diamonds weighing approximately 47 carats each that were attached specifically for this portrait. Another version of the portrait, above, which Boutet de Monvel made after the success of the original, is the highlight painting of the auction, which includes the contents of his Paris “hotel particulier” as well as his studio. 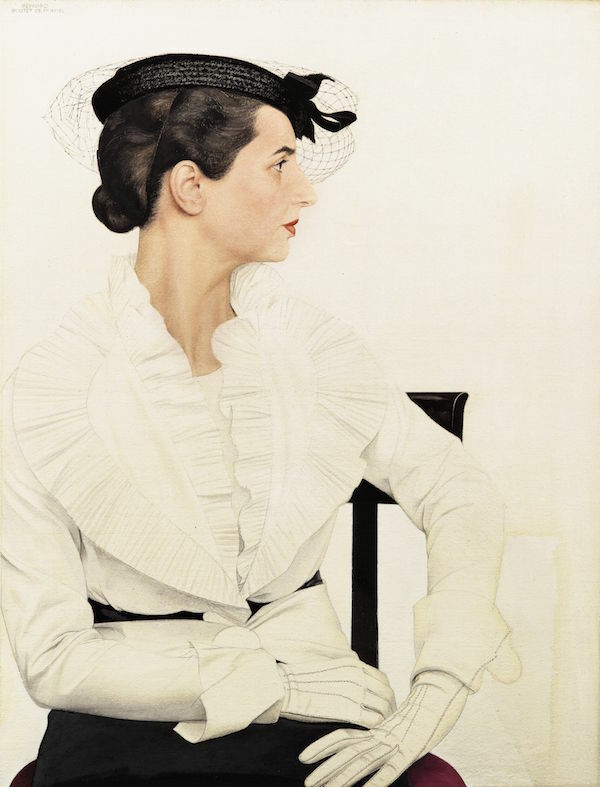 A painter, engraver, sculptor and decorator as well as illustrator for publications such as Vogue and Harper’s Bazaar, Boutet de Monvel was not only a renowned portraitist but a popular member of Café Society. His elegance, style and personality captivated the American press, dubbing him “the handsomest man in Europe.” Not unlike Fulco di Verdura, he traveled in the same social circles as those who would become his clients. 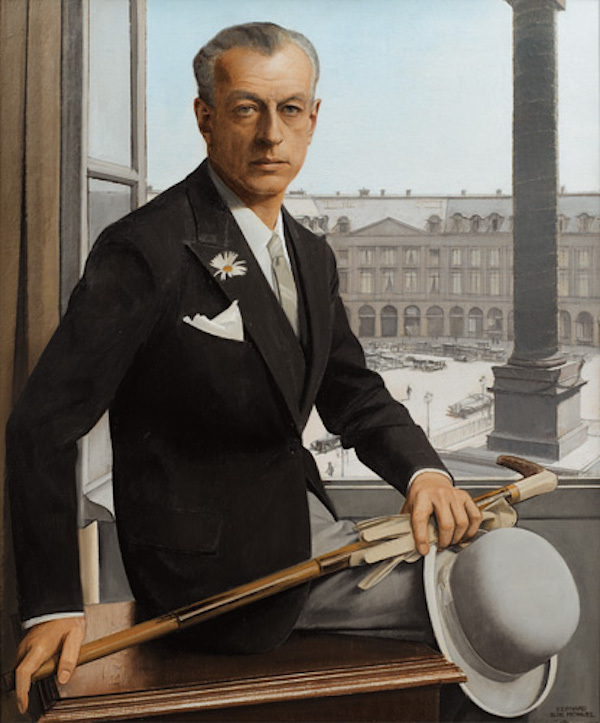 His self portrait below, one of several in the auction, portrays himself dressed impeccably in a room at the Ritz, overlooking Place Vendôme. Here you can see the very stylized, clean lines and cool colors that characterized much of his work. Boutet de Monvel’s personal sense of style endeared him to society figures on both sides of the Atlantic who clamored to commission portraits. Prince Sixte de Bourbon-Parme, William Kissan Vanderbilt, Lady Plunkett, Millicent Rogers and Mrs. Payne Whitney all sought Boutet de Monvel for his elegance, talent and ability to portray his subjects with grace and precision. Below, Madame la Duchesse de Brissac in a satin Christian Dior dress and Deco emerald jewelry, is a replica the artist made after he painted the original now in the Château de Brissac, the tallest château in France still owned by the Cossé-Brissac family. 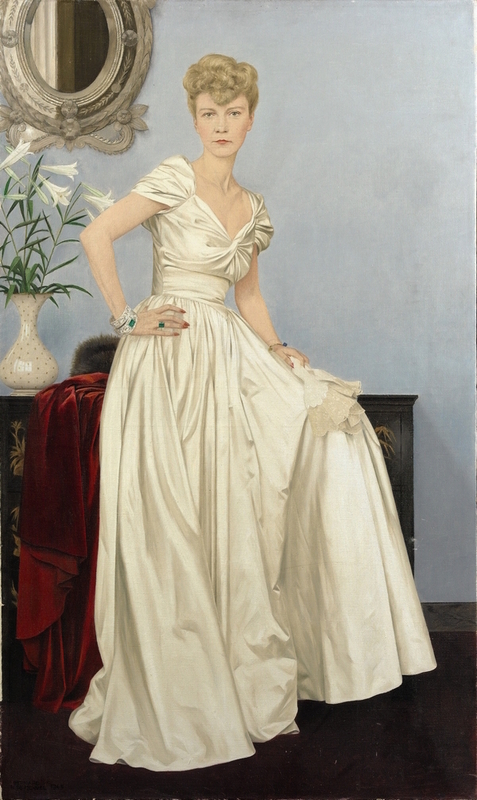 Boutet de Monvel also painted family portraits, an elegant painting of his wife, Delfina, below, in the auction. It was his process of working from photographs that allowed him such hyper realistic definition. The refined architectonic lines and a modern almost disarming accuracy were his signature. The collection portrays a man whose entire life was dedicated to the perfection of beauty, from his servants’ uniforms to his daughter’s hair. And at home, his residence was indicative of his exquisite taste, with furniture from the likes of Jean-Michel Frank (an ebonized wood and leather desk is in the auction) to several pieces of furniture he created for himself including a dining table that is also included in the sale. Others recognized his talent in the decorative arts and Mona Bismarck commissioned the artist to paint four decorative panels for the bathing pavilion of their villa. 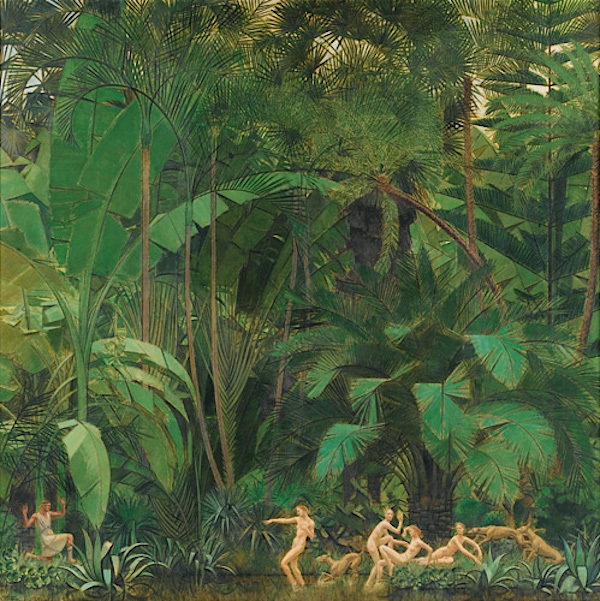 While her husband Harrison Williams ultimately rejected the project, Boutet de Monvel painted a version for himself, Diane et Actéon which will be featured in the auction. Take a minute to watch Bernard Boutet de Monvel expert Stéphane-Jacques Addade speak about the artist and his work, with glimpses of his chic homes and studio. He was definitely a man both of and before his time. For those in Paris or London, there will be exhibitions preceding the auction this month and next – February 26 – March 1 in London and March 29 – April 4 in Paris. This entry posted in art, auctions. Entry Tags: art, auction, Boutet de Monvel, Painting, Paris, Sotheby's Bookmark the permalink. Thank you for drawing attention to a great artist and style-maker. Anticipating the sale greatly. Wonderful!! Thank you so much for this post and the fascinating video. I will be passing this on…. Loved this. And this art style. So beautiful. Wish I could follow the auction live. A great portrait painter and a wonderful fashion illustrator in the 1920’s!! A terrific portrait artist and a wonderful fashion illustrator during the 1920’s. Rizzoli put out a beautiful book of his work about 20 years ago. 84 queries in 1.026 seconds.